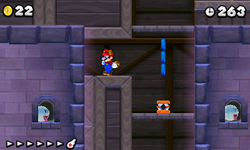 World 4 is the fourth normal world appearing in New Super Mario Bros. 2. It is a snow-based world, and the levels are made up of snow or ice. The map music is the same one which was used in World 3 of New Super Mario Bros. Wii. This world is unlocked when a player completes World 3-Castle. This is also an optional world as the player can choose to go to World Flower instead. There are 12 levels and five Toad Houses in this world, making it the longest world in New Super Mario Bros. 2 (World 3 has the same amount of levels, but two less Toad Houses). Of the 12 levels, eight levels are on the main path, which includes five normal levels, a Ghost House, and the Fortress and Castle. 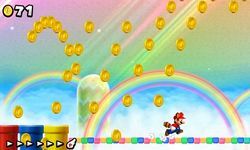 Of the remaining four levels, one is the Rainbow level, one is a level requiring payment of Star Coins and the other two are secret levels. Of the five Toad Houses, two are red, two are green and one is yellow. The boss of this world is Morton Koopa Jr., who is fought at the castle level. 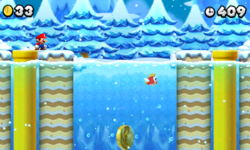 World 4- The rainbow course, featuring coins that drop from the sky and leap from below. World 4-1 World 4-1 is the first level of the fourth world in New Super Mario Bros. 2. 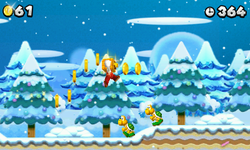 It is a snowy level that contains Icy Spiked Balls and Goombas. 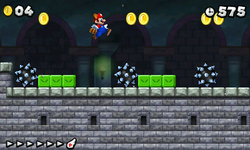 World 4- World 4-Ghost House is the Ghost House in World 4 of New Super Mario Bros. 2. 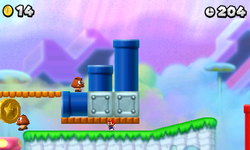 This level is an autoscrolling level controlled by Boos that control walls on both sides of Mario. World 4-2 World 4-2 is the second normal level of World 4 in the game New Super Mario Bros. 2. 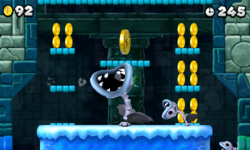 This level is an icy level that has many Koopa Troopas and Piranha Plants scattered throughout. World 4-A World 4-A is the first secret level in World 4 in New Super Mario Bros. 2. This level contains many Mushroom Trampolines and Goomba-releasing Warp Pipes. World 4- World 4-Tower is the tower of World 4 in the game New Super Mario Bros. 2. 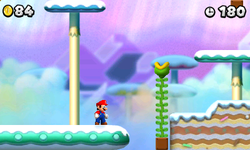 The level contains rising ice platforms that Mario must maneuver while avoiding enemies such Bone Piranha Plants and Buzzy Beetles. World 4-B World 4-B is the second secret level in World 4 of New Super Mario Bros. 2. 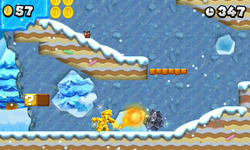 This level takes place in an icy cave, where Amps can be found following circular tracks. World 4-3 World 4-3 is the third normal level in World 4 of New Super Mario Bros. 2. 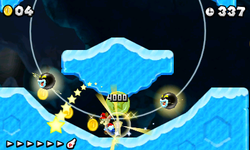 It is an icy level containing many slopes and Piranha Plants. World 4-4 World 4-4 is the fourth normal level in World 4 of New Super Mario Bros. 2. This level takes place in the sky, where Scales and tilting Mushroom Platforms are found. World 4-C World 4-C is the third secret level in World 4 of New Super Mario Bros. 2. This level is a cave level that features Fuzzies and POW Blocks. World 4-5 World 4-5 is the fifth normal level in World 4 of New Super Mario Bros. 2. 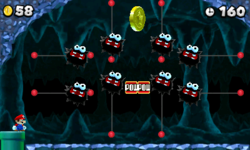 This level is an underwater level containing Cheep Chomps. World 4- World 4-Castle is the castle in World 4 of New Super Mario Bros. 2. This level contains many Spiked Balls and Snake Blocks. Morton Koopa Jr. is the boss of this level. 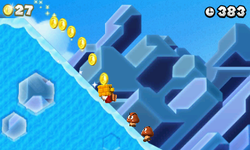 Some levels in this world have a jagged mountainous background that is similar to those found in several levels in Super Mario World. Warp Pipes in map makes their only appearance outside of levels. This page was last edited on December 22, 2018, at 07:09.